Wax Market size was more than USD 8 billion in 2016 and will witness 3% CAGR during the projected timespan. Rapidly expanding packaging industry will be a major factor responsible for driving wax market growth during 2017 to 2024. The product finds extensive applications as coatings used across packaging and paper industries to provide additional protection against microorganisms, foreign odors, and moisture. These coatings also help in preserving the aroma and flavor of packaged food and are used for packaging food items such as meat, vegetables, fruits, and fish, and non-food products such as electronics. Increasing per capita income in Asia Pacific countries has led to improvement in living standards which is clearly reflected in their food and lifestyle products preferences. Cosmetics industry is another major growth driver for market over the next few years. It is widely used as base material in various cosmetic formulations; hence, important constituent of cosmetics. Cosmetics industry has been experiencing rising demand especially from Latin America and Asia Pacific since past decade. This surged demand has substantially contributed in cosmetics industry growth in these regions. The major hurdle for market growth during the forecast timeframe will be fluctuation in raw material prices. Oscillating petroleum and crude oil prices cause variations in the production pattern and costs, which ultimately impacts the supply & demand dynamics. 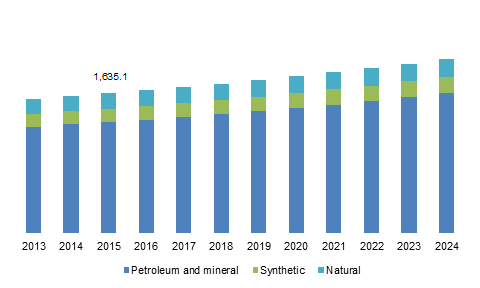 Petroleum and mineral was the largest segment in the global market in 2016. Petroleum wax is produced as a by-product in the Group I base oil production process; hence, it is a crude oil derivative. It offers a wide range of physical properties that can be tailored during the refining process. The segment is experiencing high demand from end-user industries, as it can practically replace petroleum waxes in various applications. Candles lead the global wax market share in 2016. The product is widely used in the manufacturing of scented candles, decorative candles and other variations. The demand for candles remained high in North America and Europe throughout 2016 and reached its peak during Easter and Christmas. This application segment shall remain moderately attractive during the forecast timeframe. Adhesive was another prominent application segment in the market in 2016. It is used in polyvinyl chloride processing, manufacturing of hot melt adhesive and conversion of polyolefin. GTL waxes are used primarily in hot melt adhesives as these offer properties such as low viscosity, high temperature resistance and hardness. The cosmetics segment is anticipated to witness maximum gains in the global market over the forecast period. The product is widely used in cosmetics as it possesses skin-nurturing properties. Growth of the cosmetics industry due to amplified socio-economic factors in APAC will be a major factor driving industry growth by 2024. Asia Pacific held maximum share in overall market in 2016, both, in terms of revenue and volume. Rapidly growing packaging manufacturing base in Asia Pacific, especially in Japan, India and China has played a crucial role in propelling product demand in past few years. Cosmetics and adhesive end-user industries were the highest contributors in terms of demand for wax in 2016. Moreover, the growing consumer goods demand in Latin America and Asia Pacific shall be responsible for fueling product demand in the coming years. Middle East & Africa is another important region in global market and shall grow at a significant CAGR during the forecast timespan. This can be attributed to the wide base of crude oil & petroleum industry operating in gulf countries and Saudi Arabia, which directly eases the availability of raw materials for manufacturing and thus leading to high input to output ratios. The mature markets of Europe and North America are expected to witness moderate growth rate over the forecast timespan. 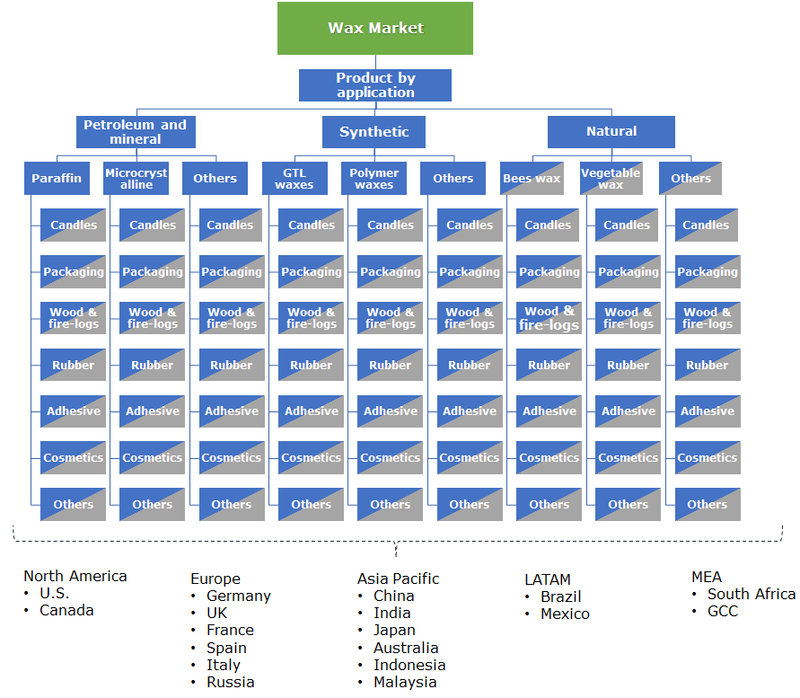 The global wax market is highly concentrated, with the top five players accounting for close to 70% of the industry share in 2016. Some of the major players in the market include China National Petroleum Corporation, International Group, Inc., Exxon Mobil Corporation, Sinopec Limited, Royal Dutch Shell Plc, Lukoil, Total Petrochemicals and Petróleos de Venezuela, SA. Majority of petroleum wax manufacturers exhibit a high degree of vertical integration, as they produce petrochemicals and are captive consumers of petrochemicals used in the manufacturing process. Integration across the value chain helps companies reduce the overall production cost. Examples of such manufacturers include China National Petroleum Corporation (CNPC), The International Group, Inc., Exxon Mobil Corporation, Sinopec Limited, and Royal Dutch Shell Plc. A few large market players have established their own strong distribution channels through subsidiaries and joint ventures. For example, Sasol Wax entered into partnerships with major local players in order to increase their presence in the local market. These companies typically offer products through supply agreements, distributors, and suppliers. Waxes are organic compounds that are malleable at room temperature and turn into low viscosity fluids at slightly higher temperatures. The product can be manufactured from crude oil and natural oils such as palm and soy oils. It is extensively used in packaging, rubber, adhesive and cosmetics industry. Paraffin and petroleum waxes are used in several cosmetics, personal care and pharmaceutical products. Natural waxes, which includes bees, vegetable, etc. are gaining popularity among manufacturers owing to it’s easy availability of raw materials.